Unlike all other US airlines I made bookings with, such as SouthWest, JetBlue, Spirit, WestJet, Copa etc, American Airline seem to have a super complex process for bookings being made with credit cards issued in India. This is my experience this month. 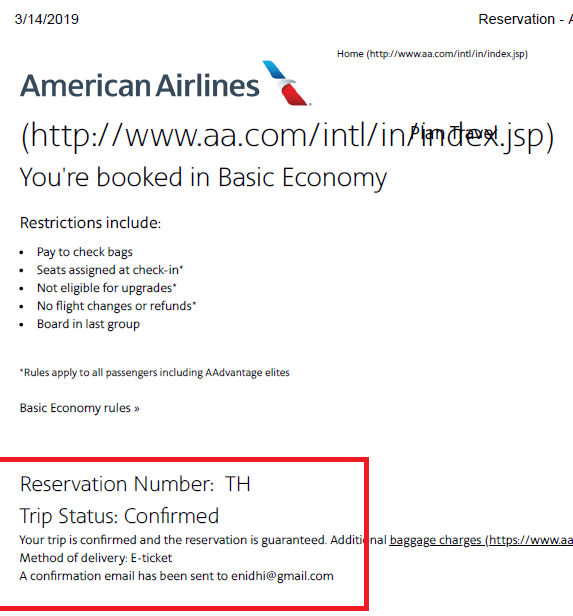 March 14th I made a booking on American Airlines, from Bahamas to Miami. Payment was made with friend’s credit card and I got a confirmation onscreen, that said ticket is confirmed. I thought everything is sorted and forgot about it. Apparently they sent a mail soon after, which I didn’t care to read as I thought it is just email confirmation of the booking, which I had already saved as PDF. They had charged only 1 USD to my friends credit card and the balance I was supposed to pay via NEFT and then inform customer care or get OTP and call customer care. To me this looked like the 1990s process of online transaction. All other US based airlines I booked tickets on- SouthWest, JetBlue, Spirit etc didn’t have any problem accepting online payments through credit cards (Southwest accepts debit card as well)- so why American has this complicated process? Not sure why is this in place- AA doesn't trust Indian credit cards? Or Indian banks don't trust AA? Why was "confirmed" was shown initially? Why not say upfront "Indian credit card holders- don't bother booking with us"? I tried calling American Airlines customer care in India. Unlike many other US based airlines who operate only within and around Americas, American Airlines flies to several destinations around the world, so they do have offices in many countries. That is certainly a positive-I don’t have to call US customer care, but it was useless. The website said India customer care is open from 9 AM to 5 PM. When I called them at 9.50 AM, no one was in office to receive the call. Phone rang and rang and eventually hung up. I called again at 10.05 same thing. Tried one last time at 10.18 and this time my call would get disconnected automatically (not even on hold) saying “All customer care executives are busy”. At this moment I lost all interest in flying on American. I sent a tweet, replied to their mail and checked other alternatives. Luckily SouthWest had a flight NAS to FLL on same date for same amount. I promptly went ahead and booked a ticket on SouthWest, got instant confirmation. Got a standard reply on twitter promptly asking to DM details. 11.20 AM I get a call from American Airline customer care- they offer to connect me to an IVR into which I was supposed to enter all card details and make payment. Fare difference applies and I don’t know what other complications they bring up. I told them to cancel the ticket as I have already booked elsewhere. The staff didn't have an iota of regret or disappointment that his company is losing business and a customer. No attempt made to give alternate options or understand why I want to cancel. He was happy to get rid of me and my booking and end the call. Why would Indian customers (or customers with India issued credit card) be ready to go through this complicated process? American isn’t super cheap, their basic economy fare is higher than that of low cost carriers but service wise same (no seat selection, no refund and various other restrictions). 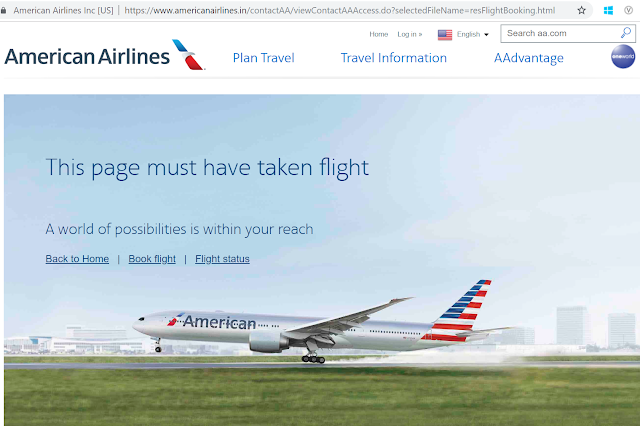 Because of current experience, I may not even bother opening American next time I search for flights. Looks like this process is unique to India issued credit card. 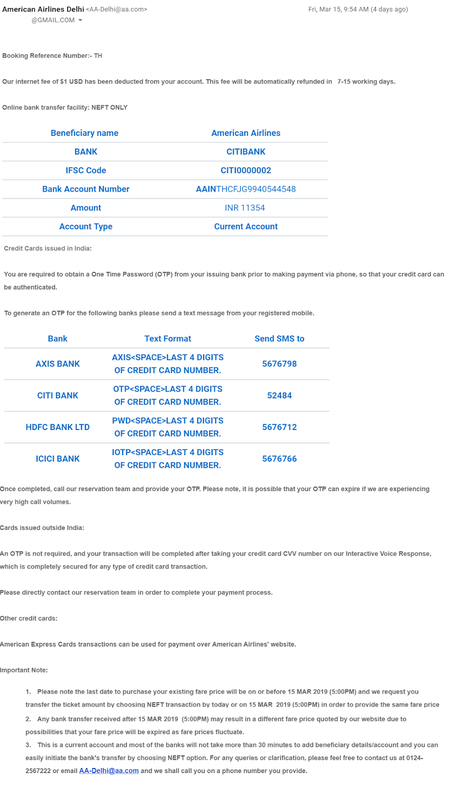 If you have a credit card issued outside of India your life will be more simpler and you may get instant confirmation. Internet is full of incidents of American moving a ticket to “Ticketing pending” status for wide range of reason- need for additional information etc, making customers panic and run from pillar to post to get their tickets confirmed. Earlier I had another issue with American as well- I wanted to fly with them Miami to Austin for about 8300 INR, but since I had an issue with my card at that time, I opted for Pay Offline. I got a hold ticket but no option to pay online. Only option was to transfer money to bank account of AA and email/talk to customer care. I got my card issue sorted and tried pay online and get confirmed ticket-absolutely no option. Tried making a fresh booking but rate had gone up by 3000 INR, so I lost interest, booked my flight on Spirit instead, which was still cheaper despite having to pay 37$ for cabin bag. I was looking forward to experience American but their super complex process, buggy website and ‘not coming to office on time’ customer care in India made me lose interest and book elsewhere. Hopefully they will improve their process. When all other airlines have got things sorted, American is unnecessarily complicating things. Of the 13 different flights I booked for my US trip, none of them were with top 3- United, American or Delta- due to their high pricing mainly and complicated process in case of American. How was your experience with American (particularly for bookings from India)- good?